Hello my lovelies! I know many of you love jewelry as much as I do and because of this I wanted to share a jewelry company with you called Stella & Dot. You may have heard of the brand before from seeing it in magazines or on celebrities as I did, and they are basically a company similar to Avon in that they have stylists who sell the jewelry and become entrepreneurs themselves. I definitely respect that it gives women a chance to empower themselves with something they already like... jewelry! Stella & Dot: Now with more armpit! I mentioned this in the video that I am selective in saying yes to review products in general but I am quite happy with the quality of products I received and I wouldn't be doing this review and giveaway unless I was truly satisfied with the quality of Stella & Dot's jewelry. I am not going to lie, a huge downside is that it is on the expensive side, but you also get what you pay for in terms of nice materials and there are many gold-filled and 925 sterling silver pieces to choose from. It has been my personally philosophy to buy nicer jewelry rather than costume pieces for a while now due to my metal allergies so this did make me particularly happy. For those of you who have no problems with metals, Stella & Dot does have a wider range of jewelry at different price points in items that are simply gold or silver-plated but it's worth noting that the items I received are on the higher end. What can I say? My body literally demands more expensive taste (otherwise I break out). Har har. You can learn more about Stella & Dot's Entrepreneur Program here. Contest is only valid for the U.S. and Canada (excluding Quebec). You must be 18 or older to enter. Contest will end on May 20th at 11:59 PM Central Time. Winner will be chosen randomly from the comments and will win a necklace (of their choice), the earrings, and ring noted in the video. So tell me in the comments, which piece do you like the best? I undoubtedly have to say that both the silver disk necklace and the stacking rings have been on high rotation for me lately but I'm sure there will be cameos of the others in the near future. Haha, I'm definitely in it for the earrings! I love the Signature Dot Disc Necklace and the Tassel Necklace, they are so so cute. Thank you for sharing! I love the clover necklace in gold - the perfect layering piece. Great giveaway! I love the Bamboleo necklace! I'm a Stella & Dot stylist: stelladot.com/juliechang. If you or anyone else is interested in any of the jewelry I'd love to help your clients get a hold of this quality jewelry!!! The filigree earrings are one of our most popular and of course the bohemian looking revival tassel necklace which has been on IN STYLE is huge. Thanks for reviewing the company!! I love this company!! The disc necklace is my fave because of how versatile and classy it is! OOo I love the signature disc necklace! I love the necklace. So easy to wear yet so chic! I have just watch almost of your videos and it's amazing. Good honest advice and fun too. Can you help me to do a Hair care reviews or email me about that because besides face and skin, hair is very important that affect our look. so if you can help, that would be so nice. Especially products or any advice that helps prevent hair breakage. thanks Jen! I love the disc necklace.. I love the Bamboleo Necklace. So bold and colorful~! 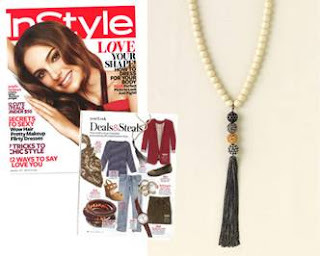 I love the Revival Tassel Necklace and the Bamboleo Necklace! I love your review and the Stella & Dot jewelry! I did everything to enter the contest. I love the signature disc necklace as it is really simple and classic. I have entered myself in the contest. I think my favorite is definitely the lucky seven rings. I love stackable rings like that!! Jen where did you get your mustard color cardigan? Very cute! I love the rope necklace! And I entered doing all the rules.